If you’re a frequent after-midnight McDonald’s customer, your menu choices are about to change drastically. Nation’s Restaurant News reports the company will streamline its late-night menu at all locations open after midnight or 24 hours, in an effort to improve speed. Starting April 30, McDonald’s will only offer the following after midnight: Big Mac, Quarter Pounders, Chicken McNuggets, All-Day Breakfast, fries and other sides, sweets and treats, Happy Meals, and McCafé beverages. 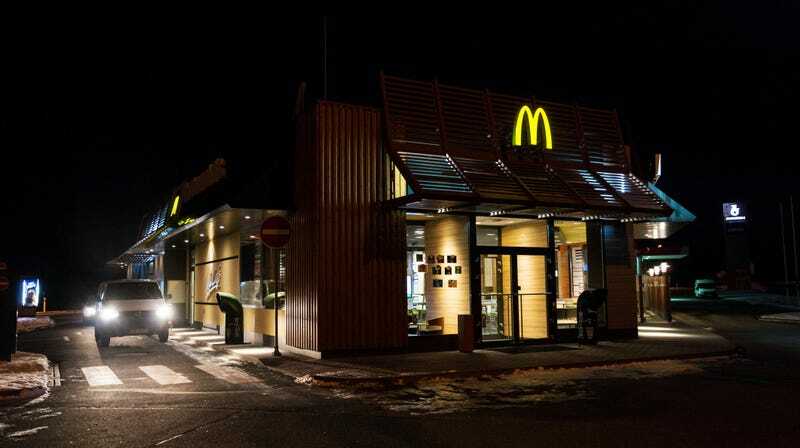 For some of us who can’t remember the last time we were awake past midnight, let alone hitting up the drive-thru at that hour, the change won’t have any effect on our McD’s experience. But my first thought upon hearing this news was of people who have non-traditional work hours, and might regularly eat at McDonald’s during the late-night time slot. If their favorite order was a Hot ‘n Spicy McChicken, they’re out of luck. Or, if you find yourself out late, and the idea of a beef hamburger sounds irresponsible and so your preferred 1 a.m. indulgence is a Filet-O-Fish—as some Takeout staffers are wont to do but won’t publicly admit—you have until the end of the month to enjoy this. The question is whether customers value speed over menu choices. McDonald’s was named the chain with the longest drive-thru wait times in a report last year, and this streamlined menu is an effort to speed up service. On the heels of McDonald’s announcement that it will invest in upgraded drive-thru technology, the pared-down menu seems to indicate the company is betting big on fast, efficient ordering. But will it matter if customers can’t get their favorite sandwich at 2 a.m.?